Evans Ahorsu, 2019: Amina is married with four kids. Her husband is a farmer. Amina won’t wait for her husband to come back from the farm to take some responsibilities. She picks corn, puts it in a sack on her bicycle and drives to the cornmeal machine whenever her husband is not around. She believes the sharing of labour is the best. Nuku Studio, in collaboration with Noorderlicht House of Photography in Groningen, The Netherlands, has been producing a project in the North of Ghana: 'Stories from the North'. Stories from the North aims to tell stories from a region we don't hear much about in the medias, a region that is often “underlooked”, both here and in Ghana. Obvious issues are not prevalent in Northern Ghana, at least not in a way that is relevant to international media. That is precisely why this project opts for this region: to share the richness, diversity and energy of this area with everyone, through stories from the North. 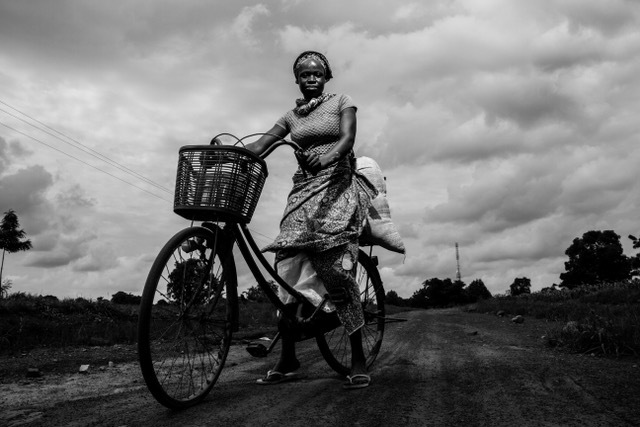 These stories are all connected to the SDG's gender, migration and climate change, and told through the lens of five Ghanaian photographers: Evans Ahorsu, Mabel Senaa Bonsuuri, Geoffrey Buta, Nyamekye Joey and Qujo Buta. In the light of 'Stories from the North', these partners realise various projects, with as the first outcome the book and the exhibition “Northern Ghana Life”, of which eleven Ghanaian and international photographers were part. This exhibition and these stories about SDGs in the context of Frame Voice Report forms the second part. Nuku continues to explore the Northern region through photography, and those new stories will be released in a second photo book. The Sustainable Development Goals (SDGs), or Global Goals, aim to end to poverty, inequality and climate change. The goals were drawn up by the United Nations in 2015 and should be reached by 2030. The SDGs build on the success of their predecessor, the Millennium Development Goals. However, they are more ambitious: they are not just about poverty, but involve human rights, economic growth, peace and security, and climate change. Altogether, the Global Goals emphasise the interconnectedness of a globalised world. For the goals to be met, everyone needs to do their part: governments, the private sector, civil society and people like you. Within the context of the Global Goals, and this specific project and exhibition, three topics are specifically relevant for the Frame, Voice, Report programme: climate change, migration and gender. In fact, gender and climate change are central to the causes and consequences of migration. The Exhibition Opening takes place on 12 April 2019, in Amsterdam at iMPACT DOC, with curator and project manager Marc Prüst. The exhibition is organised at the occasion of World Press Photo Festival, and will be open until 5 May.